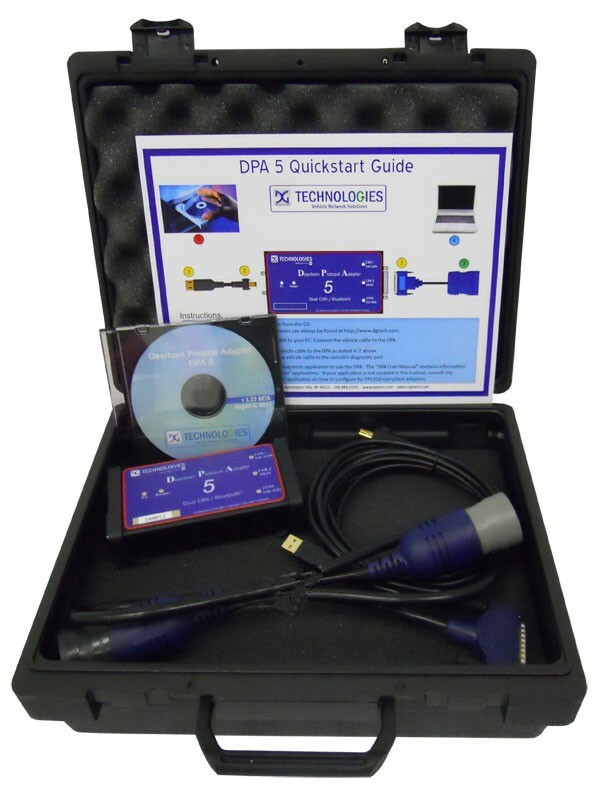 The DPA5 is a vehicle datalink adapter (VDA) used by technicians worldwide to manage RP1210 & J2534 service bay diagnostic and reprogramming activities. The DPA family is well known throughout the commercial vehicle industry for its speed, ruggedness, reliability and versatility when managing diagnostic activities and ECU reprogramming. It is used for a multitude of tasks including engine, brakes, transmission, chassis and other repair activities enabling technicians to fix vehicles faster. Commercial fleets on the street use the DPA 5 to monitor OTR activities such as vehicle speed, braking conditions, GPS positioning via satellite uplink and a myriad of other activities. The DPA 5 is compatible with 2013 and newer Volvos using the Volvo PTT application as well as the Freightliner Cascadia models using ServiceLink or DDDL software. The DPA 5’s Bluetooth wireless compatibility allows technicians to manage diagnostic activities up to 100 feet away from the vehicle depending on service bay or site conditions. Reprogramming vehicle ECU’s using the Dearborn protocol adapter is made easier by following the detailed instructions in the User’s Manual provided with the kit. DG Diagnostics software provides both vehicle and industrial stationary equipment diagnostic support for OEM manufacturers. DG’s software can access vehicle networks to read/clear basic diagnostic trouble codes, create reports and monitor live traffic not only on highway vehicles but also on many OEM agricultural and medium duty vehicles from CnAutotool.com. What you need know for Cummins Expired problem? What you need know for Cummins Expired problem? 1.After you change the computer time to 2015.1.1,and get the new password from us.Please do not change the computer time again,or the software will be not available to use. 2.Your computer time is 2015.01.01,in normal way,when time comes to 2015.07,it will display expired again,please send us new ID to get password and operate like expired problem solution again. 3.When you send us PC ID and verfication code,please do not close the software page,if you close it and start it again,the verfication code will change,then the activation will fail. Part one: I have installed the insite software and the driver for inline hardware, but wen i connect the hardware, my computer do not detect the hardware, and no inline 5 cummins is flashing on the device. Part two: I have today connected the inline box to an engine ECM. Now is the power LED on. My Computer detects the Hardware, but I think it is a wrong Driver installed. Is it possible that I have a wrong Driver? we have bought a inline 5 box, and on the DVD from you is a inline 6 Driver? the instructions on your Website to installed insite is not match with my Software and Hardware….is that possible? Can you send me an inline5 Driver? The power led light is on so the device is OK. The problem was not correct driver software. I have installed driver for inline6, but I have inline5. On the DVD is a lil misunderstanding by installation. There are two folders, one for win7 only, and I have installed that for my win7. The driver for the inline5 is in the other folder. I have test it now on a Komatsu excavator with cummins engine QSB6,7 and CM850 Controller, and it works well..
cummins inline 5 insite is a base on Win 7 Operating System PC-based software application that provides quick and easy access to your engine’s electronic performance information, it helps to ensure accurate procedures and diagnosis and limit downtime, while increasing productivity and profits.